use to vary your attack hits. 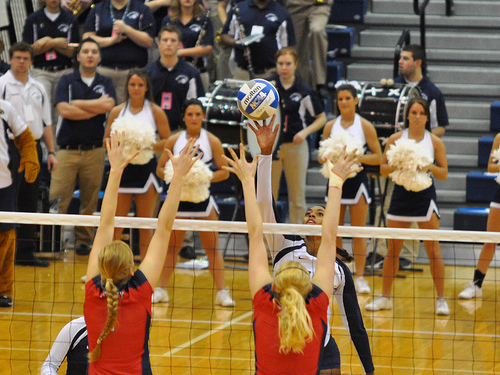 The Volleyball Hit: Be sure to mix up your shots as an attacker. Learn your options. 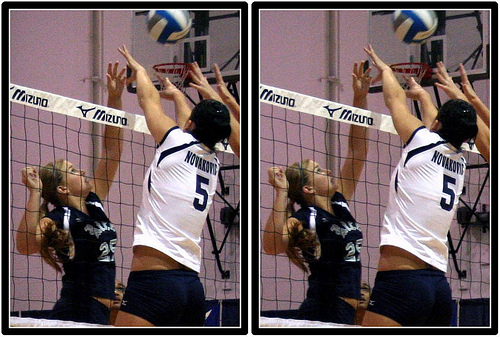 Be sure to include "the tip" as a hitting volleyball strategy you use to change up and vary your attack hits. Plan on adding the tip to your collection of hitting tactics used to score points, especially during long rallies. You can become as confident as you want to as a hitter, but the best ones are always prepared by having practiced many different ways of scoring points offensively, not just one. You want to be unpredictable as a hitter. And if your spike attacks are always hard hits, then that's very predictable. Sooner or later your opponents block or defense will anticipate and read where you intend to hit next and pick up on your tendencies. 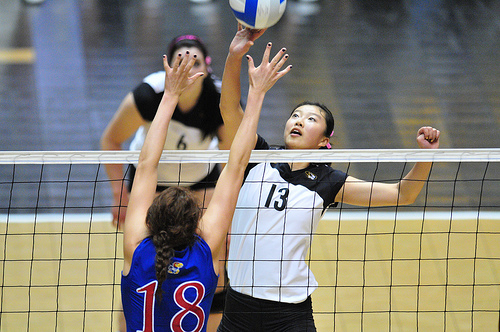 Volleyball Hit Strategy: You want to be unpredictable as a hitter. And if your spike attacks are always hard hits, then that's very predictable. Try tipping! When opposing players scout you and your team they will say "Yeah we know how she hits. She always spikes the ball hard. That's all she knows how to do. So let's set up our block here and our defense here. And if we can't stop her hard hit at the net with our block, we will pick it up in the back row with our defense." They will also say "Sure she hits the ball hard and we know that she will score some points for her team, but if she keeps hitting hard, all the time, for the entire first set, then we know she will get tired. When she gets tired then she won't hit as hard and it will get easier to block her spikes at the net or it will get easier dig a ball she hits. And sooner or later it will get harder and harder for you to score points against a team because they already know what type of spiker you are and they will set up their team defense accordingly. Instead of always relying on the hard hit, use the tip as one of your highly effective offensive attack hits. 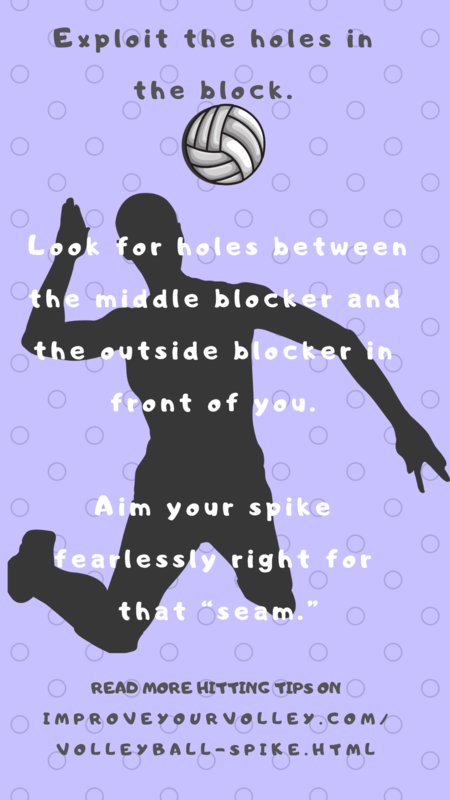 Learn to use this in practice during your volleyball hit drills and spike training. This will keep the defense guessing as to how you are going to attack the ball next. Work on all of your hitting strategy, like mixing up your shots during practice. 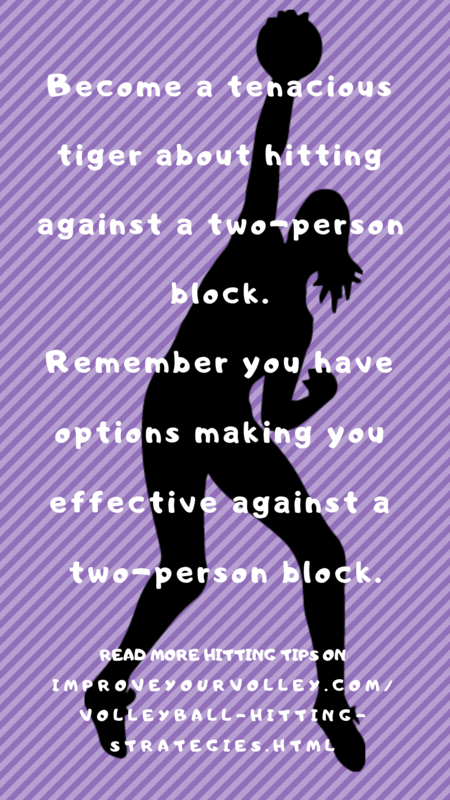 You can improve your offensive game by spending your time wisely doing repetitions of different volleyball hit options that will prepare you for many of the different blocking or defense strategies the opposing team will use to try and stop you in a game. In your spike training drills, you want to know and you want to practice all the possible things you will do, if and when you get the perfect set. Of course, when you get a perfect set you are going to want to hit the ball. But, that is also what the defense is expecting you to do. To mix up your game, in practice, when your setter sets you the perfect ball to hit, don't! If you do, you will catch the defense back on their heels because they expected you to hit that ball hard and instead you fooled them and tipped it softly over their block, short in their court. Now they have to scramble to pick a ball up that they didn't expect to get. This means you must be flexible. You must be prepared to do what your enemy does not expect you to do. This is what smart hitters do. They look for opportunities to outsmart the opposing team's defense. 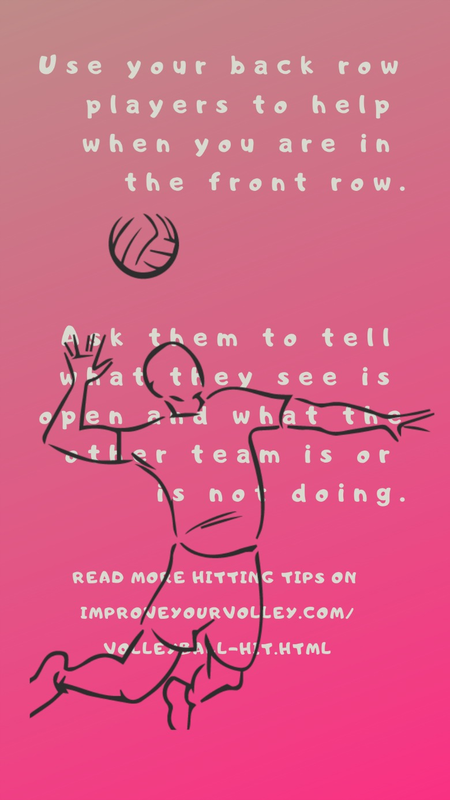 After you've hit several balls hard against their block, on the next good set your setter gives you, you should tip the ball to an open space on the opposing team's court, they will never expect it. A good strategy to adopt is for every 5 or 6 balls that you hit you may want to try a tip on the next good set that you get. Sure I know that you use the tip to save a broken play because many times, at the last minute, that's the only thing you think you can do to keep the ball in play. But the question is still, how are you going to use the tip to save a broken play? This suggestion may sound risky but like all things once you get used to doing it in practice then it will become a habit. Once things become a habit, then we aren't so afraid of trying them when we have to, like in a game situation. One way a player like yourself, can save a broken play is to soft tip the ball into the block on purpose. Professional players use this tipping technique to give themselves another opportunity to attack the ball. The way to do this is to aim the ball at the wrists and forearms of the opposing teams blockers as they are in the height of their block against you. 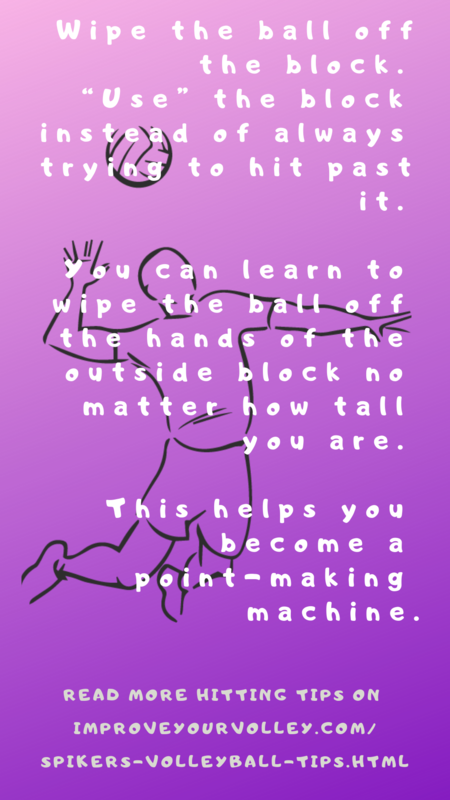 You do it by contacting the ball with the tips of your fingers and actually aiming it for the blockers wrists and arms so the ball will bounce back high off of their arms and back into your court in a way that your team, who should be covering you in defense as you hit the ball, has a chance to easily replay the ball, digging it back to your setter so she can set up another play. If you're an outside hitter then you can use the tipping strategy I talked about above to your advantage by aiming the tip for the external wrist and arm of the outside blocker in front of you. 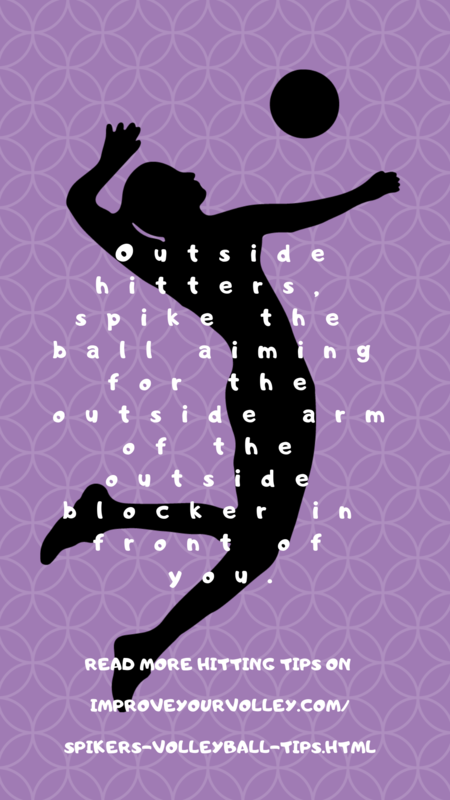 Many hitters practice spiking a ball against the arms of the blocker so that the ball comes back outside their court boundary line which gives the hitter's team the point. As mentioned at the beginning of this article, this technique is called "wiping off the block", or "using the block". Well, you can do the same thing with the tip. 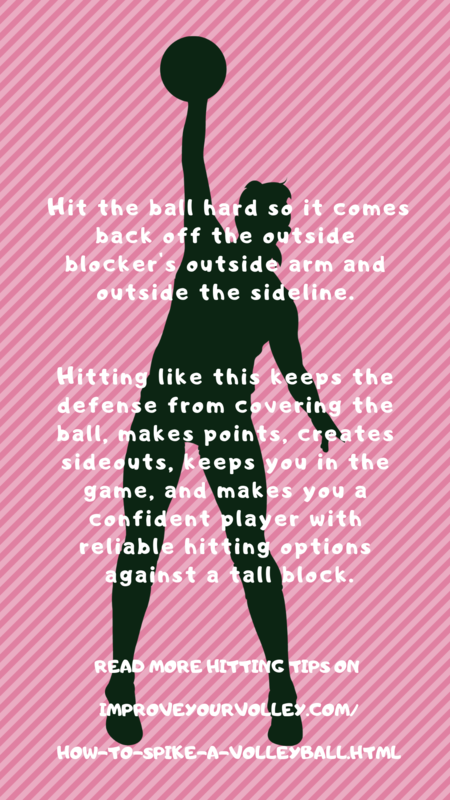 Instead of hitting the ball hard, if you get a set that's a little too close to the opposing blocker and you still need to do something to score a point, go up to tip the ball and aim it for the outside arm of the blocker, the arm that's closest to the antenna. Just as you do when you're spiking a volleyball, make sure the blocker is the last person to touch the ball before it goes out of bounds on your side of the court. Now, that's called "using the block" with your tip. 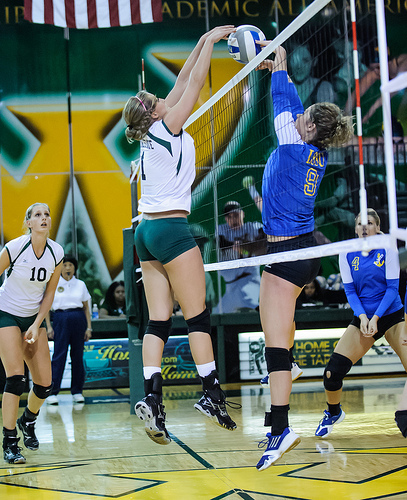 Volleyball Hit: If you find yourself in a joust with a blocker on the opposing team, then you want to be sure to be the last player to touch the volleyball. Once again this third exit strategy you can try will always be useful to you because it’s extremely difficult for the opposing volleyball team’s defense to pick this ball up. If you find yourself in a joust with a blocker on the opposing team, then you want to be sure to be the last player to touch the volleyball. A joust happens when you are spiking a volleyball and your set may float over the net more than you expect, so now you are forced to just jump up and push the ball over the net. Almost at the same instant, the opposing team's blocker who is blocking against you realizes that you wont be able to hit the ball like you wanted to because the ball is floating over the net a little too far out of your spiking arm reach. So now both of you see the same ball that is directly over the net, half on your side and half on their side and you both jump up to push the ball over on the other player's net. 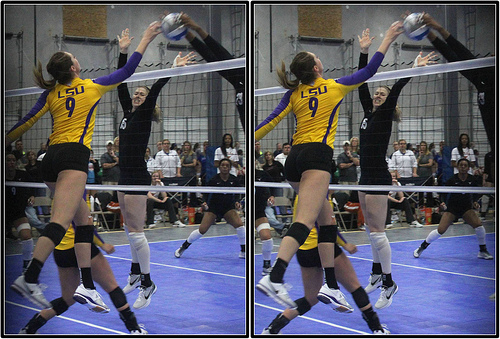 When you both contact the ball, over the net, in midair at the same time, that is called a joust. 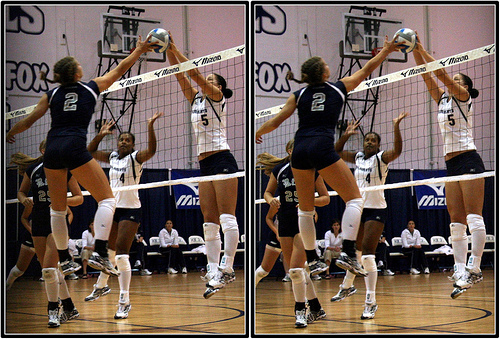 The second volleyball player to touch the ball has the advantage because she is going up and pushing the ball over while the first player is on the way down, losing her momentum and moving away from the ball. In practice when you are spiking a volleyball make sure you work on perfecting this jousting technique so you can use it to score points against the block. 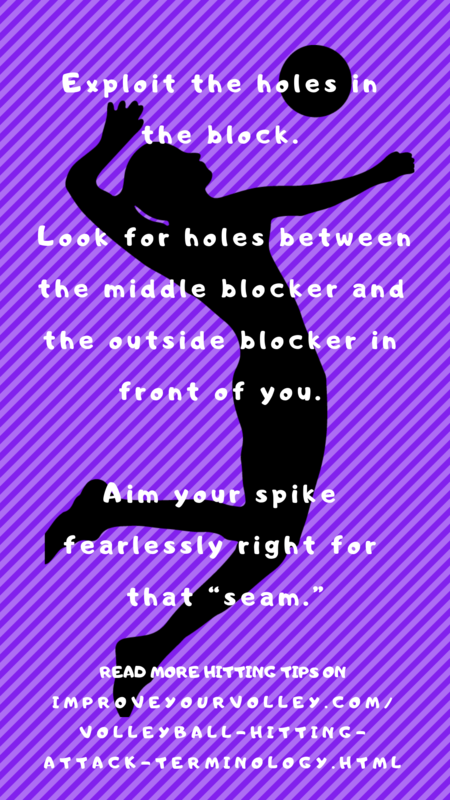 When hitting a volleyball in practice drills, another spike strategy to practice is tipping the ball deep in the court. 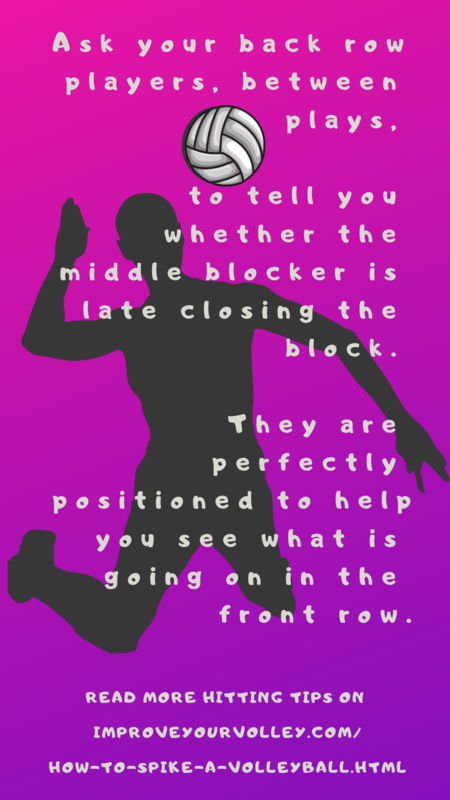 Often volleyball hitters will choose to automatically tip behind the block in an emergency situation, especially when they can’t see the open areas of the court. In practice, you should remember to rehearse tipping deep to open areas in the opposing team's court so that it becomes a normal habit, regardless of what situation you find yourself in. To make yourself into a valuable point scoring hitting weapon you want to have a collection of options to use instead of relying on just hard volleyball spikes so that you have an offensive option that you can fall back on in any situation. Learning how to spike a volleyball consistently for points in many ways is like learning how to play chess. b) it’s easier for you to score points or sideouts in the latter part of the game.